"But in war nothing is so slight as not at times to bring about a great result." - Livy, Book XXV. xviii 3Book 23 (Campanians revolt) & Book 24 (War against the Syracusans)& Book 25 (The Fall of Syracuse)My sixth (of fourteen) Livy's History of Rome covers books 23 through 25 (216-212 BC). Volume VI details the post-Cannae battles, spread between Greece, Spain, Italy, and Sicily. Hannibal always seems one day, one step, one coin-flip away from destroying Rome, but somehow MOST of the alliances stay. The elites in the cities allied to Rome seem more inclined to Rome, while much of the populace seems to favor Hannibal.My favorite part of this book is the details concerning the "unrivaled art" of Archimedes' many defense of the walls and fortifications of Syracuse - and eventually -- the needless death of Archimedes. The fall of Syracuse is one of those war-time events that has long-term, significant impact on the world. Much of Roman fascination with Greek culture came as a direct result of the sack of Syracuse. Anyway, again I love a good war story and the Second Punic War has to be one of the top 10 most influential and interesting wars. I also love how Livy throws all sorts of marvels, signs and portents throughout all three of these books: an ox spoke, a spear moved, a baby in a womb shouted "Hail Triumph", a woman became a man, palm took fire, swarm of bees in the forum, lightening, ravens in temples, chalk rain, bloody-looking rivers, terrible storms, a stone seems to fly, the sun is red, almost bloody, snakes appearing and eating the livers of sacrifices - twice. Here are some of his best lines from Vol VI:"In fact you must either have a king -- save the mark! -- or a senate, the only deliberative body in a free state" (Book XXIIII, iii 5)"...the most familiar evil is the most endurable" (Book XXI, iii 14). "For not to be defeated by Hannibal was a more difficult thing that it was later to defeat him." (Book XXIII, xvi 16). "Never a nag, please, into a ditch" (Book XXIII, xlvii 6). "...many things which are naturally difficult are solved by ingenuity." (Book XXV, xi 16). "...not even hunger, which, as he said, inflames even dumb brutes, could spur their diligence;" (Book XXV, xiii 7). This review is the same for each of his volumes: Livy is the quintessential historian of ancient Rome. He had his obvious flaws - no one could consider him unbiased in his approach, and he creates dialogue between historical figures that encourage the virtues of the citizens. Still, he is very entertaining. Each of his extant works - most of his books have been lost - presents a far nobler Rome than we have come to expect. Reading Livy is a luxury few are privileged to partake of. Fantastic. 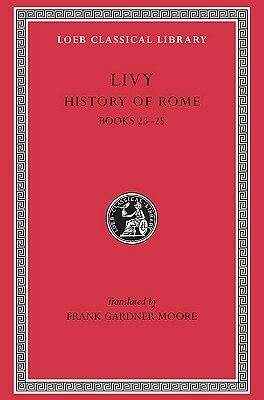 Livy Frank Gardner Moore - Titus Livius (Patavinus) (64 or 59 BC – AD 17)—known as Livy in English—was a Roman historian who wrote a monumental history of Rome and the Roman people – Ab Urbe Condita Libri (Books from the Foundation of the City) – covering the period from the earliest legends of Rome before the traditional foundation in 753 BC through the reign of Augustus in Livy's own time. He was on familiar terms with the Julio-Claudian dynasty, advising Augustus's grandnephew, the future emperor Claudius, as a young man not long before 14 AD in a letter to take up the writing of history. Livy and Augustus's wife, Livia, were from the same clan in different locations, although not related by blood.